Author Rian Malan wrote a best-selling, autobiographical account of his return to South Africa after having been in exile for eight years. It was fitting that the book, “My Traitor’s Heart” opened with the quote “How do I live in this strange place?” taken from the Bernoldus Niemand song “Reggae Vibes is Cool”. Bernoldus Niemand was the pseudonym used by James Phillips. The South African Postal Service honoured Kerkorrel and Phillips in 2014 when their images were included in a set of 10 stamps based on the artwork of Vumile Mavumengwana. The stamps were released to acknowledge ten musicians whose work had been instrumental in effecting change and uniting South Africa. 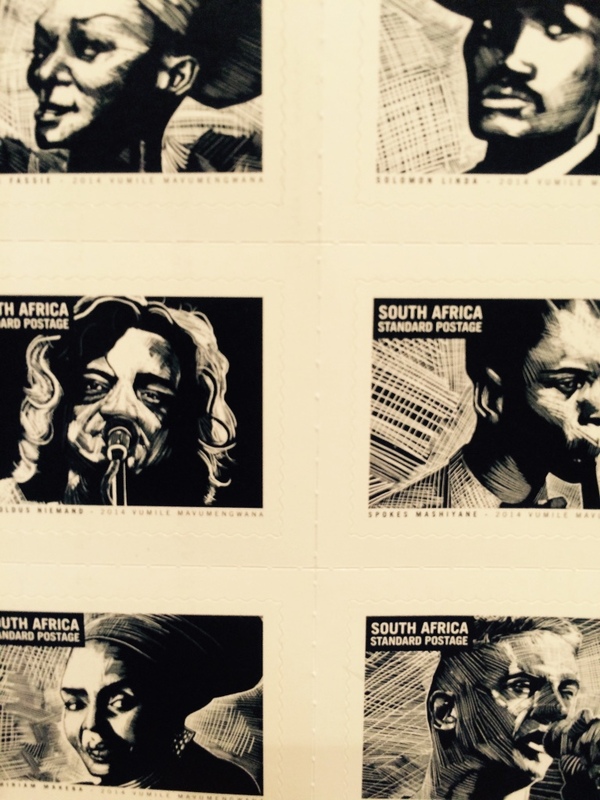 South African stamps featuring popular-music legends. July 2014. 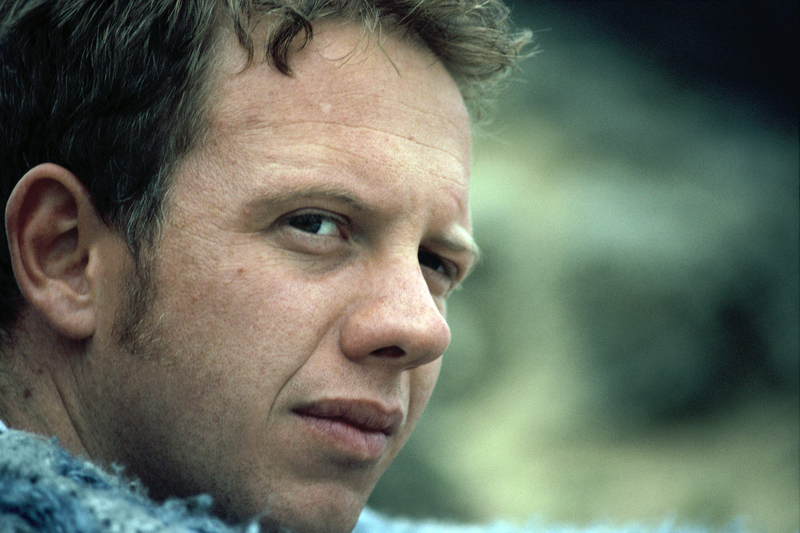 A new generation of Afrikaans singers have written songs acknowledging Kerkorrel’s impact on them and mourning his death. Lydia vom Hagen’s “J.K.” in which she borrows many of Kerkorrel’s lyrics is an achingly beautiful song and illustrates just how much Afrikaans music has progressed since the time of the “lekkerliedjie”. “Kleinmond Koebaai” (Kleinmond Good bye) by Koos Kombuis and Valiant Swart is a nostalgic reflection on the Voëlvry tour. Jan Blohm’s hard rock “Johnny K” rages about the tragedy of his death and imagines him driving by in a “pitch black Cadillac” with Jimi Hendrix. The fact that Blohm links Kerkorrel with the iconic Hendrix underlines just how important a figure Rabie is in modern Afrikaans music. In “Kerkorrel” Jak de Priester expressed regret that he never got to know Rabie properly. De Priester has acknowledged the impact that Kerkorrel had on his career and remembered the first time that he saw Kerkorrel on television and how the sight of this Afrikaner in a black leather jacket and sunglasses “freaked” him out completely. Karen Zoid, the female rocker who Rabie had admired, wrote a song, “Foto teen die muur” (Photo on the wall), on her 2003 album “Chasing the Sun” for Kerkorrel. The rock band “Glaskas” covered Kerkorrel’s “Revolusie” on their 2012 album “Verganklik en Afhanklik”. In an interview the band noted how unbelievably well they felt that the lyrics of the song still applied to contemporary times and that this influenced their decision to use this song instead of the better-known “Hillbrow” or “Halala Afrika”. Afrikaans singer-songwriter, Riku Lätti on his 2009 album Tussen Kontinente (Between Continents) covered Kerkorrel’s “Somer”. The album also featured a song, Ysbeer (Polar Bear) in which Lätti sang about how Kerkorrel had influenced him as a musician. Another Afrikaans musician Kristoe Strauss recorded a tribute entitled, Sit dit Self Af (Switch it off yourself) to Kerkorrel. Amanda Strydom, who was long-time friend and contributor, also recorded the song Ek Het Gedroom (I dreamed) about her memories of Rabie. Some contemporary Afrikaans musicians have asked what has become of the Voëlvry generation, for much like the hippies of the sixties despite calling for massive societal change; they too have been drawn into complacency. Andries Bezuidenhout wrote a song called “Dis Net Werk Toe Wat Ek Nog Deur Hillbrow Ry” (It is only on my way to work that I drive to Hillbrow) in which he asked what had become of the punk spirit that so defined Voëlvry. He mourned the fact that those who danced to Kerkorrel’s virulently satirical song BMW, now all appeared to be driving BMWs. To Bezuidenhout it was sad that the only time that he now considered Hillbrow, the subject of one of Kerkorrel’s best-known songs, was when he drove through the run-down suburb on his way to work. The song borrows lyrics from Rabie’s Hillbrow and references many of the places that Kerkorrel had sung about in his song. Bezuidenhout grapples with the decision of a close friend to emigrate, but affirms his commitment to South Africa, stating “Is ek deel van hierdie land met liefde en haat/ het ek te veel gegee en te veel gevat/ om die donker land nou te verlaat”.